It’s festive and fun and completely customizable. But, my favorite part about this cake is that it’s made almost entirely of ice cream. And ice cream melts. So it’s the perfect excuse to eat a huge slice fast and then have seconds before it turns into a giant puddle of sweetness. My love of ice cream cake runs deep. 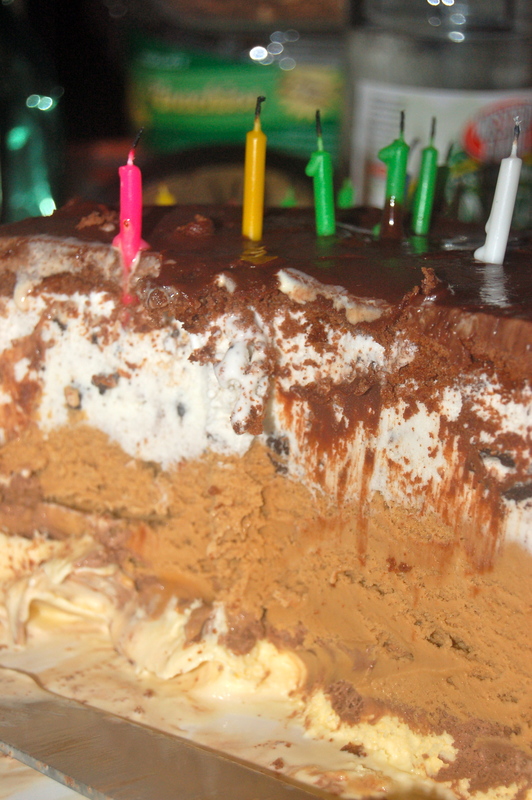 On my 11th birthday, I asked for a coffee ice cream cake with chocolate frosting. Instead of buying one from Ben & Jerry’s or Baskin-Robbins, Pom made me a coffee ice cream pie with an Oreo cookie crust. It was really good, but it wasn’t ice cream cake. I remember that I felt a little, teeny bit disappointed. (I should say now, almost two decades later, that the very fact my mom chose to make me special ice cream birthday dessert instead of taking the far easier path and simply purchasing one, made me one very lucky kid.) This is all to say that growing up I had always assumed ice cream cakes – you know, the big ones with layers of cake and ice cream with frosting on top – had to be purchased from a store. I first learned about homemade ice cream cake in Santa Barbara. 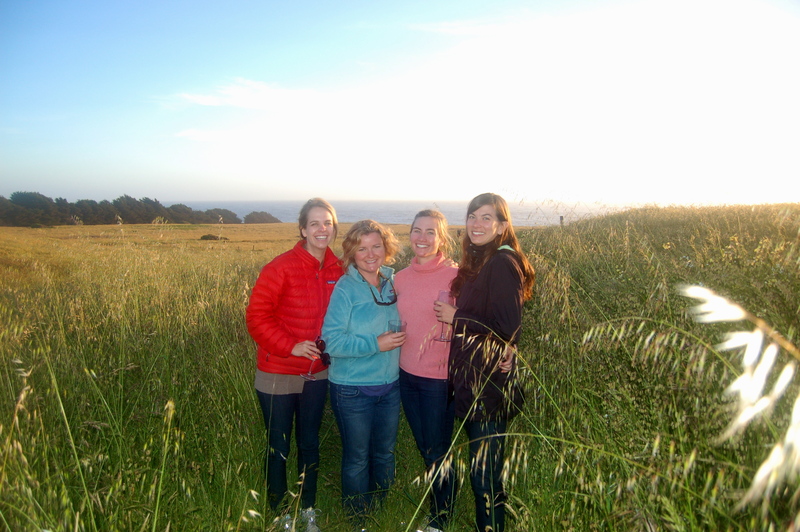 I was visiting my friends Em and Nattie in early July to celebrate (* the operative word!) Em’s 20th birthday. I remember watching the construction of her cake in sheer amazement. It wasn’t tough to do. It was fun. It was homemade. Flash forward a decade later and I’m a few hundred miles north on the California coast in Mendocino. A bunch of us friends rented a house over Memorial Day weekend to *celebrate* a slew of impending June birthdays – all turning the big 3-0. Zoe, Drass, Whit and Ellie. Happy Birthday to you!! The ice cream cake I made in Mendocino was enormous. I found an extra large mixing bowl in the cupboard and ended up needing a gallon and a half of ice cream to fill it. I added 48 ounces each of four different flavors – Cookies and Cream, Double Espresso, Caramel Chocolate Crunch, and French Vanilla – layered inside the bowl lined with 1) plastic wrap and 2) smushed Betty Crocker chocolate cake. 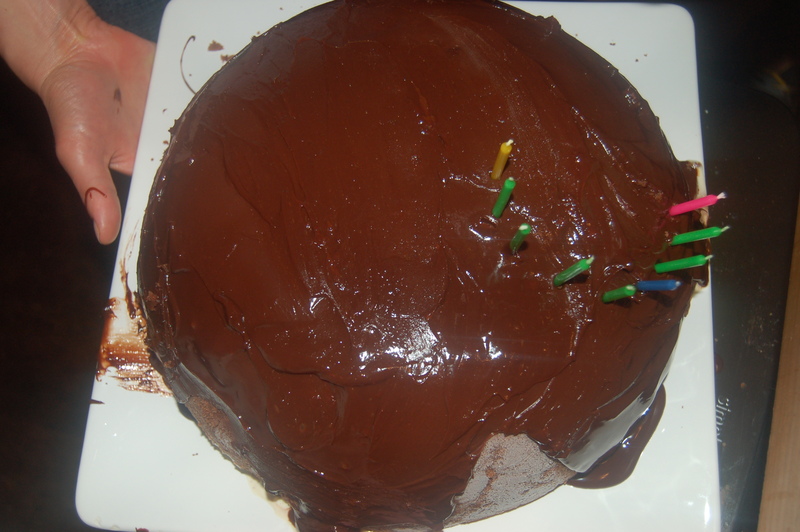 After a couple of hours in the freezer, I flipped the bowl ‘o soul onto a serving plate, smothered its cake crust exterior in dark chocolate ganache, jabbed it with candles in the shape of 30, and lit the delicious dome on fire. CELEBRATION! You should make one too! It’s easy and freezy and a giant crowd pleaser. I promise. You don’t even need a good reason, like a birthday, to make it. This cake is a celebration in and of itself. It exudes celebration. It tastes like celebration. It creates a celebration. Really, it does. Serves anywhere from 6-20 people, depending on the size of the bowl and your love of ice cream. Line a medium-sized bowl with plastic wrap (this is VERY important), making sure the entire inside surface is covered. Cut the cooled cake in half lengthwise so it’s half the thickness. (Don’t worry if it doesn’t look pretty. It won’t matter in the long run.) Then cut into 2 inch squares. 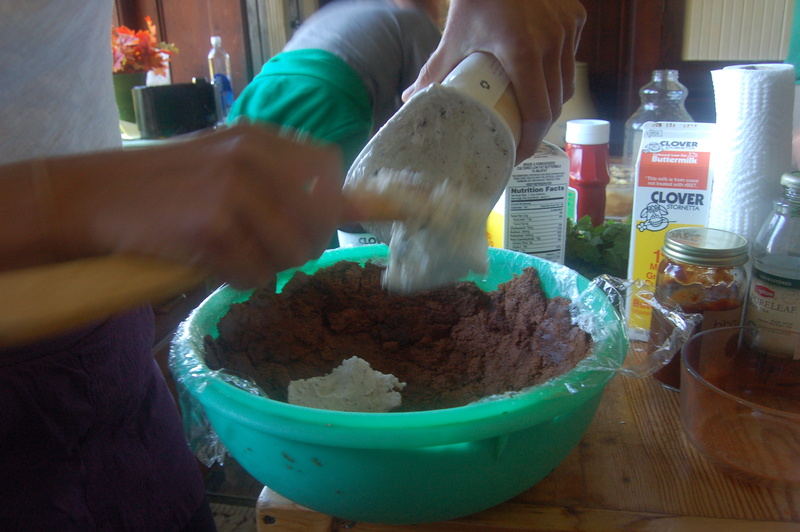 Firmly press cake squares into the bowl, forming a thin layer that completely covers the inside surface area. Place bowl in freezer to set for at least 30 minutes. 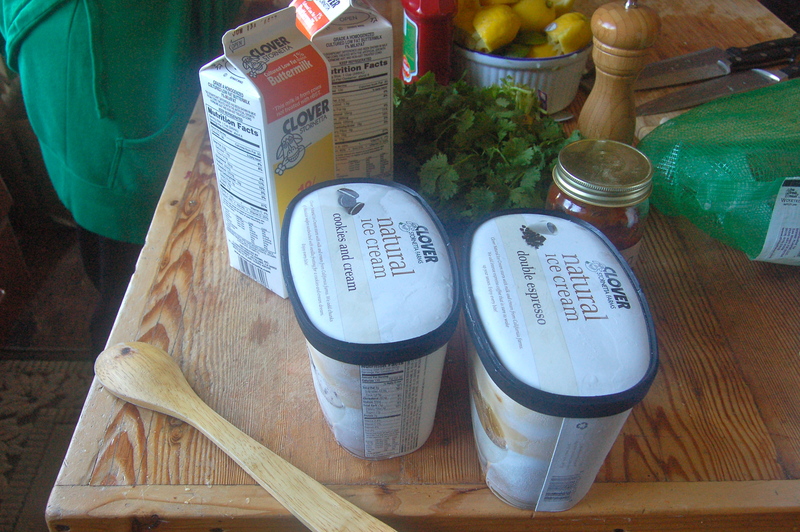 Remove bowl with cake crust from freezer and add ice cream. You can layer more of the cake in between flavors if you have extra squares. Or layer in sprinkle nuts or cookies. Or not. Make sure you fill the entire bowl with ice cream because the last layer of ice cream will be the bottom layer of the finished cake. Cover bowl with plastic wrap and place in the freezer for at least a couple of hours. Remove bowl from freezer and flip onto a large plate, removing any sticky plastic wrap. Pour ganache* over the top, smoothing with a spatula. Decorate with candles or sprinkles or candy or just let it be. And CELEBRATE! Heat the cream and butter in a saucepan until just boiling. Remove from heat and immediately pour over chocolate chips. Let stand for 5 minutes, then whisk until smooth. Add pinch of sea salt. 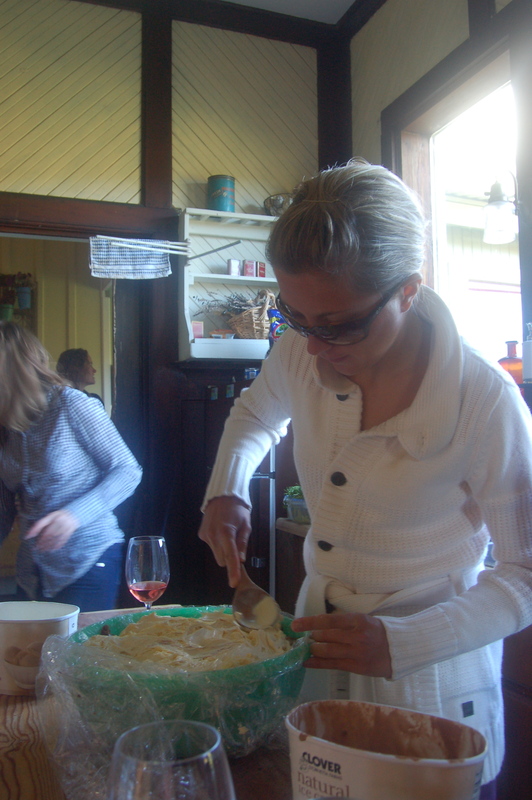 i totally remember making that ice cream cake in SB — yum! When Katie Drasser was in kindergarten, she asked me (her mom) to bring jello to school for her birthday celebration. Mind you all other birthday kids asked their moms to bring chocolate cupcakes with white icing, chocolate cupcakes with chocolate icing, etc., etc., etc. Then, in first grade, Katie wanted banana bread – Oh, another popular treat! 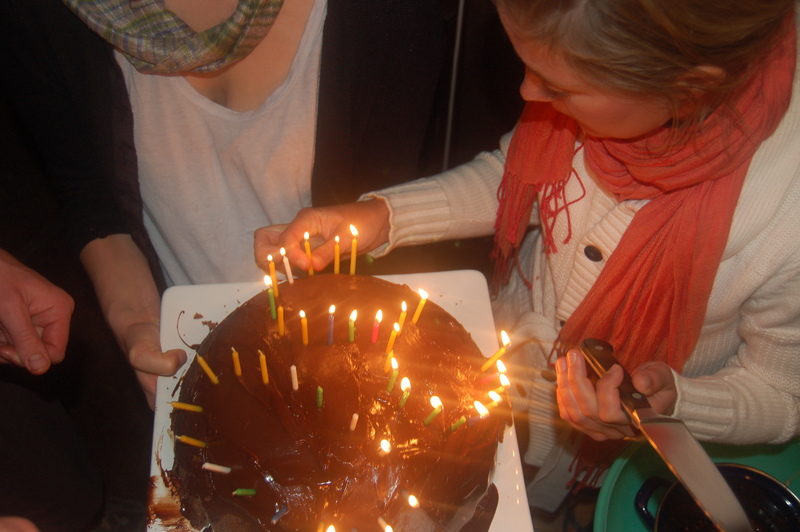 Annie – I am sure that your wonderful ice cream cake was a huge hit with all. Wonder if Katie’s early school friends would agree that her birthday “cakes” were as special???!!! Yum!!! Please come to 3115 and bake and cook soon. Great meeting you. Next time it will be less peace corp and more food talk. Loking forward to chatting some more. It was so nice meeting you! I couldn’t agree more. Food talk is a priority.